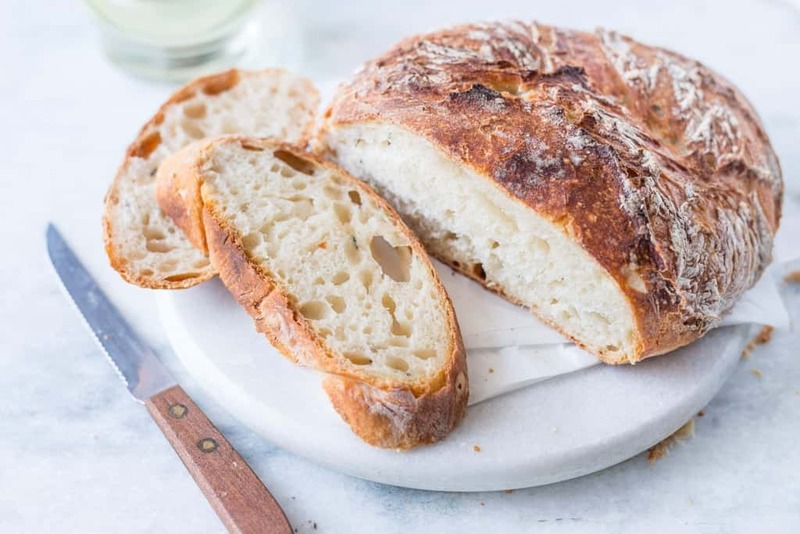 NO-KNEAD RUSTIC WHITE BREAD – I am sure you would have already scrolled through the images and must be wondering how a no knead bread can have such a fabulous texture. Believe me or not, the bread that you are seeing is No-knead and I have spent hardly 5 minutes to put everything together. No dirtying your hands, no muscle work… but you need to have loads of patience. And when you see a freshly baked bread with a lovely crust and a chewy texture, all your waiting would seem worth. It’s not that I don’t love kneading bread dough. I absolutely love doing that. Bread from my archive Strawberry Focaccia, Turkish Lamb Pide, ARTOS..all of these bread needed a good amount of kneading. 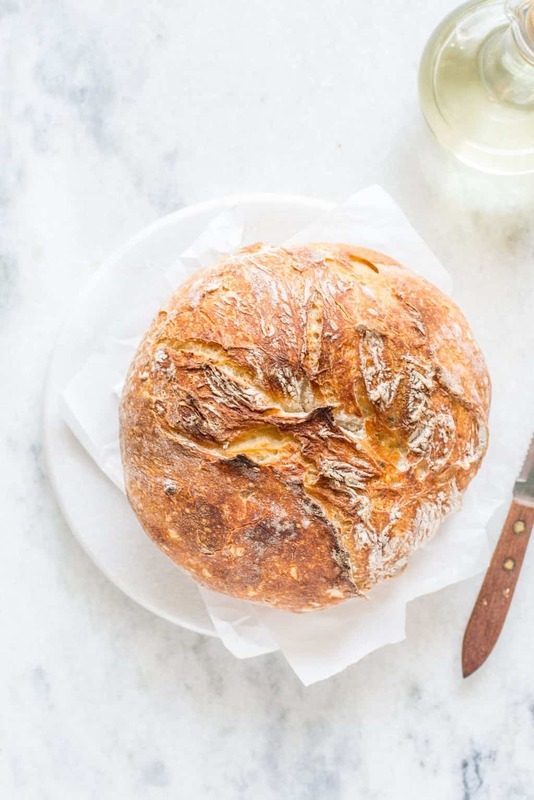 But there are times when you are really in a mood to have some freshly baked bread but don’t want to sweat to bake a bread, these kinds of bread comes to your rescue. The dough is quite wet here. Even the amount of yeast used is quite less. Because of long resting hours the dough rises enough and also develops good flavour. You might find the dough quite stretchy, this is because the flour gets enough time to absorb the liquid. if you find the dough is not stretchy enough then the dough needs more hydration. After resting the dough overnight, the dough would appear bubbly but would have flattened at the top (which is normal). the dough needs to be handled with well-floured hands. If you find it difficult in shaping the dough, Keep the dough in the refrigerator for a couple of hours. It is comparatively easy to work with refrigerated dough. When the dough is still cold, shape the dough to a loaf and let it rest covered on a well-floured surface till it comes to room temperature. I haven’t tried refrigeration technique for this particular recipe but this technique is applicable for most of the Artisan bread. So if you are giving it a try ,I would love to hear about your experience. I prepared some bruschetta with roasted tomatoes ,fresh basil leaf ,buffalo Mozzarella cheese and drizzled with EVOO. In a large bowl stir together flour, salt and yeast. if adding rosemary, slightly crush it and add. Add crushed garlic (if using). Add water and using a spoon mix well. The dough will be wet and shaggy .Don't over work the dough. The less you work with it, more fluffy and soft the bread will be. Cover and let the container be on kitchen counter for 8-12 hours. (I prefer doing it overnight). The dough will rise and look bubbly at the surface. When ready to bake, Preheat the oven to 220-degree celsius. Place an oven proof baking dish covered with a lid (Dutch Oven or any heavy bottom) for about 20 minutes. While the dish is heating up, with floured hands remove the dough from the container and place on a well-floured surface. Shape it to a loaf. At the end of the heating period, carefully remove the dish. 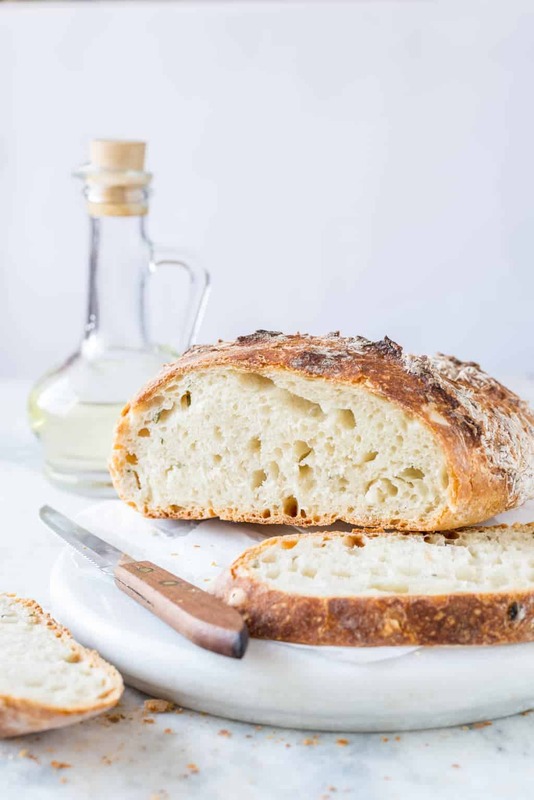 If you want to be extra careful,slide in a piece of parchment paper/or brush with oil to prevent the bread from sticking. Carefully slide in the dough ball. Cover the lid and bake for 30 minutes covered.Then remove lid and bake for 10-15 minutes / till you get a golden brown crust (Which ever is earliest) . Remove and let the loaf come to room temperature. Love baking breads.! And if it is a no-knead one. GREAT! :). I saw your post on FB and that inspired me to bake a cranberry no-knead bread. 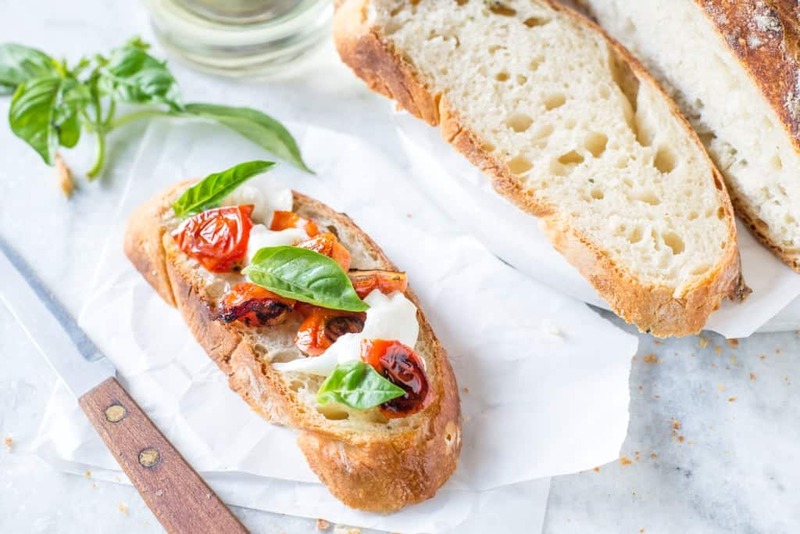 Love the beautiful looking bread in the white bg .No knead and bruschetta with that one oh how I love such days! you got the texture with 1/2 teaspoon yeast and no kneading? This is an awesome recipe! 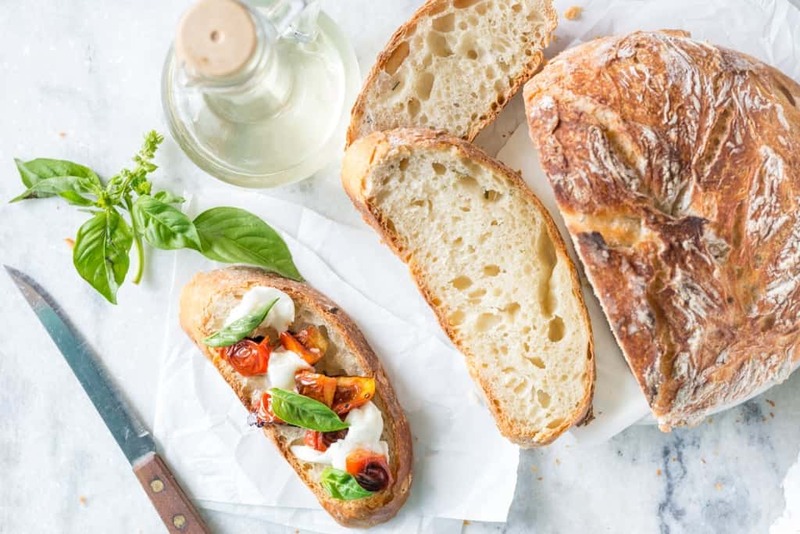 Gorgeous bread and beautiful clicks! 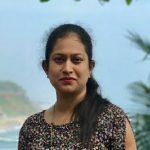 @Ishita Thank you for stopping by.. Now coming to your queries 1. Putting the lid on ,helps in building steam which gives a good crust. You can use two cake pans of same size, one of that will act as a lid. 2. It’s actually a good practice to proof the yeast(I skipped that this time) . So to be double sure you can mix half of the water and yeast with a pinch of sugar. Let it bubble. then follow rest of the procedure… It’s absolutely ok to ask question 🙂 . I would be happy to answer till you are clear with your doubts. @indu Thank you.. yes here all the trick lies in long resting time and good level of hydration. Many recipes with has slow and long rising period calls for very less yeast. @Recipes Framed Sree.. thank you so much. Cranberry is one of my favourite add-ons in cakes and bread. It goes well with orange too. you are going to love it for sure.Can’t wait to see the bread. @Meena Thank you so much.. I hear you. even the aroma of freshly baked bread enlightens your day.. Thank you for stopping by. @priya Thank you very much..